10/06/2012 - The driver of Prema Powerteam and Ferrari Driver Academy, Brandon Maisano obtained the first victory of the season at Mugello, taking advantage of a sprint start that put him ahead of his team mate Eddie Cheever. 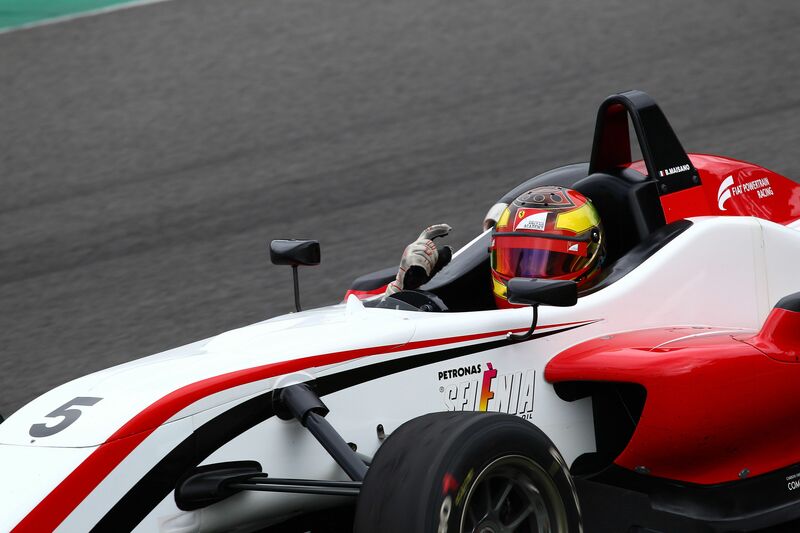 The third Prema driver, Henrique Martins, also managed to overtake Riccardo Agostini and to get the third place. Agostini lost the position also to his team mate at JD Motorsport, Nicholas Latifi but during lap one he managed to get closer to the top three drivers, while Mario Marasca (BVM) follwed as he got rid of his team mate Jousse first and then of Latifi. The driver from Latina, closing the Italo-Canadian hit the front wing of the JD driver but the manoeuvre was considered correct. The fight for the third position started between Martins, Agostini and Marasca that are very closed with Riccardo Agostini attacking Martins at San Donato but did not manage to get through. Marasca used all the track available to get close to the driver from Padova on the Mygale and managed to take him during lap ten. An error risked afterwards to compromise Marasca's race who went wide at the Casanova - Savelli and opened a wide gap to Agostini. The challenge continued until the last lap with several moves by Marasca to overtake the driver from Padova. During the last lap Martins went wide and lost a bit of ground. Agostini behind him tried to overtake him exploting the lower speed of the Brazilian, but the contact was unavoidable. Martins had the worst of it and stopped at Luco turn, while the driver from Padova managed to continue and to end third at the flag. Agostini was afterwards penalyzed by 25'' in parc fermè which promoted Marasca to the first podium in the series.